There are dark days in history. Usually they dawn without a hint of being anything but ordinary…yet end with everybody knowing the day’s events won’t be forgotten. Sadness and anger, in fact, can remain even after those who actually lived the dark day are gone. Historians can help…by examining what led to the tragedy, and why those events hold so much meaning afterwards. A dark day in South Dakota history happened on December 29, 1890. It was winter, but the day dawned sunny, warm, and still along Wounded Knee Creek in southwestern South Dakota. The people of Big Foot, a Minneconjou chief, came into contact with the U. S. Army’s Seventh Cavalry the day before. Big Foot and his people were far from their home to the north - the Cheyenne River Reservation. All that fall and early winter, settlers across western South Dakota feared American Indians were planning to leave their reservations and attack ranches and towns. Newspapers ran stories reporting danger. Colonel James Forsyth of the Seventh Cavalry knew Big Foot’s journey off the reservation would scare some South Dakotans, even though the group certainly was no war party. Big Foot had about 350 people with him, including many women and children. About a hundred were men who could be considered warriors. Many of those men had guns…and Forsyth told Big Foot his people had to turn over all weapons and then go directly to Pine Ridge, which was 17 miles away. So the morning of December 29, Big Foot’s people handed over guns, knives, axes, and even crow bars. But Forsyth believed more guns remained hidden under blankets the people wrapped themselves in against the winter chill. Forsyth told Big Foot everyone would have to line up and show they had no hidden weapons. One Minneconjou man pulled a rifle from under his blanket…and said no one had a right to take it without making fair payment. Tension grew…and a shot rang out, and then another and more until all that could be heard was the roar of gunfire. Among the first to die was Big Foot. Eighty-four Minneconjou men, 44 women, and 18 children died that day. More were wounded, and some of them died from those wounds later. Thirty-one of the 470 Cavalry soldiers were killed. 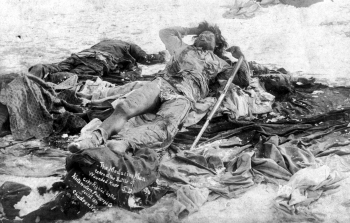 The Battle at Wounded Knee wasn’t considered a victory and became known as the Massacre at Wounded Knee.